Courtesy of Cultural Arts and Diversity. An unsuspecting, diverse set of eyes peer out beneath baseball caps as nails tap loudly on desks in Oakes Classroom 105. “Who are you, what’s your purpose, what’s your drive, what’s your goal? How do you make things change?” Don Williams asks the room. Apart from being director of the Cultural Arts and Diversity (CAD) Resource Center, Williams is the lecturer of the Rainbow spring class that studies a range of plays performed the following fall quarter. Rainbow Theater, now in its 22nd season, began as a multicultural theater troupe dedicated to telling the stories of African American, Chicanx/Latinx and Asian American narratives in one-act plays. It derived its name from the Rainbow Coalition of the 1960s, inspired by the activism and collaboration of different organizations and collectives that pushed for national change regarding people of color. Rainbow Theater’s newest additions include “Poet’s Corner,” which weaves poetry with scenes to tell students’ stories, “Outreach,” which travels to high schools in underrepresented neighborhoods every year to inspire higher learning, and the Rainbow Theater band Kadence Keys. Don Williams. Photo by Stephen de Ropp. In 1992, Williams founded the African American Theater Arts Troupe (AATAT) at UCSC to highlight African American culture through plays, a project to which he dedicated an additional unpaid 30 hours a week. Two years after AATAT was established, Rainbow Theater was born. 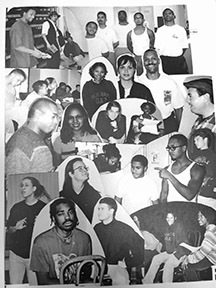 “[The] mission is to bring as many students together as possible, to give them a greater sense of identity, a greater sense of self worth and an appreciation of the arts,” Williams said 21 years ago in the student publication, Currents. In the mid-’90s, students of color represented around 20 percent of the student body. Some of those students approached Williams to help tell their stories. After watching AATAT’s success, professor Kathy Foley, who advocated for the group to perform, helped secure a space at Theater Arts. Soon after, other students of color demanded spaces in the world of theater. Students told Williams they wanted to tell their stories too. Rainbow Theater, which began as a platform for students of color to share their stories with the university, has evolved into a resource center, a class, a large-scale annual event and, most importantly, a family that remains open to change.